As the weather heats up, we all start to look at ways to keep from turning on the stove and oven when it comes time to make dinner. Sure, you can fire up the charcoal grill and enjoy the flavors of the flame, but sometimes you want something faster or a meal that isn't a burger or a steak. That's where kitchen appliances like the Westinghouse Searing Grill & Griddle can really shine. But before you rush out and plonk down your hard-earned dollars for one, let's take a closer look at what this multi-use appliance offers and delivers. A meal-making, multi-tasking appliance that combines the functionality of a panini press, contact press, open grill, large griddle and warmer into one ultra versatile appliance, the Westinghouse Searing Grill & Griddle promises a lot for an appliance that has the same footprint as a typical laptop computer. The heating plates are reversible to either a smooth griddle surface or a scored grilling surface and can be laid flat at a 180-degree angle or closed, notebook style, for double-sided heating. It also offers 5 preset temperature settings ranging from 175-degrees (for warming) all the way up to 475-degrees (for searing). 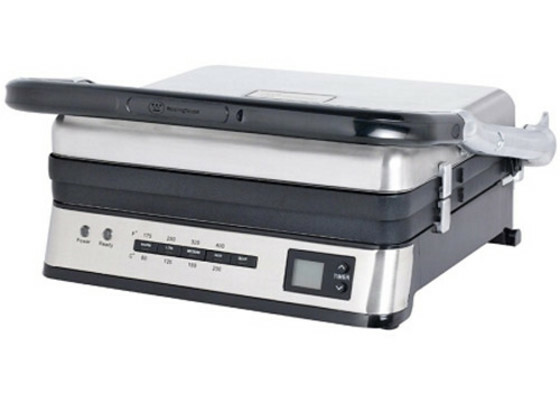 This one table top appliance is a panini press, indoor grill, and a griddle with even heat distribution and a unique hinged design which can create an expansive 12-inch by 20-inch cooking platform. The plates are dishwasher safe and cleanup (whether or not you use your dishwasher) is quick and easy with nonstick-coated cooking plates and accessories. The unit comes fully accessorized with 2 clip-on drip cups, a clip-on condiment warming cup, custom clips for securing the grill for storage, a grill cleaning tool, an instruction manual, and an instructional DVD. There are a few things that I really loved immediately about this product. The first is that it is incredibly solidly built. Westinghouse might not be well known for coming up with innovative names for its products, but they do build them to last. Unpacking this appliance and setting it up, you aren't worried that it will fall apart in months or even years. Beyond that, the heating plates have built-in heating elements and are reversible so that you don't need to find additional storage space for an extra set of plates. The sturdy casing of the unit is smooth and stays cool during use, which helps to reduce burn risk. For an appliance that can reach nearly 500 degrees, it's very important to be able to keep that heat from burning fingers when operating the settings and timer buttons or damaging countertops while in use. Westinghouse, as usual, delivers on all of these. Once you start using the unit, you'll be pleased to have a preheat cycle for all 5 temperature settings with an audible alert when the unit is ready for cooking. If you want to use the built-in timer, you can set that and power will be discontinued a minute after the timer sounds. Otherwise, you can run the unit for up to 99 minutes before it will automatically shut down. If you want to by-pass that, simply press another control button on the unit. The preset temperature settings give you a wide range of cooking temperatures. The lowest serves well as a warming option and the highest should only be used for searing food. I've used the 3 and 4 setting most often, with the 3 setting being ideal for sandwiches and pancakes and the 4 setting working well for grilling everything from chicken to burgers to steak. When cooking food that is likely to drip, attach the two drip cups and you don't need to worry about a greasy mess on your countertop. If you've got a sauce or butter that you'd like to warm or melt, there's also a warming cup that can be easily attached to the corner of your appliance. I've made everything from pear pancakes to grilled chicken to PB&J paninis to bacon on my unit and I'm still finding other things to make with it every week. It cooks what I want quickly and without drying everything out. The other day, I seared a batch of colorful mini-peppers for alongside a different dish and I don't think I could have gotten such beautiful grilled texture out of either my charcoal or propane grills, and certainly not in the short amount of time it took this unit. When you are done with your cooking, it's very important for you to allow the unit to cool for at least 30 minutes before attempting to remove the plates for cleaning. Once they've cooled, they can be placed in a dishwasher or easily cleaned with warm, soapy water. A tool for cleaning the grooves in the grilling plates is included with the unit, but I've found a soft-bristled toothbrush works beautifully for cleaning, too. Any splatter on the rest of the unit can be wiped away using a damp cloth. Replace the plates, close the unit, wind the cord into the handy compartment included on the back of the unit, and store until you're ready to use it again. It's really that simple. I've mentioned that this is a sturdy unit. That's not all good news. If you are trying to cook something delicate with the contact grill or panini press settings, there is a fair bit of weight pressing down on your food. When making paninis, I recommend using hearty bread. If you are making a grilled cheese sandwich with typical white bread, consider using the griddle setting and flipping your sandwich -- it won't end up looking like a quesadilla! While salmon can handle the contact grill setting, you might want to consider an open grill or griddle arrangement for most fish or other delicate food items. Also related to the heft of the unit, if you have trouble moving heavy appliances, this one might present a bit of a challenge. Weighing in at nearly 16 pounds, it might be best left on the countertop if you use it often. Or, you could just consider it to be part of your weight-lifting regime! I regularly hoist my KitchenAid stand mixer around, so I overlook having to do the same for this appliance. Years ago, I had a first generation Cuisinart Griddler and I loved it, despite its quirks. When the time came for me to finally replace it, I opted to give the Westinghouse Searing Grill & Griddle a go, despite an updated Griddler being on the market. Why? It's really pretty simple. Westinghouse has put together a solid kitchen appliance that delivers what it promises for a price that Cuisinart couldn't meet, much less beat. For my money, I'm happy to bet on the longstanding reputation for quality and reliability that Westinghouse has, both worldwide and in my own experience.